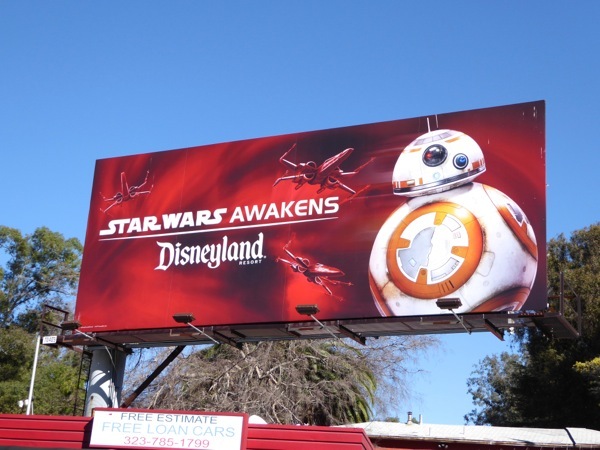 Are you ready to journey to a galaxy far, far away? 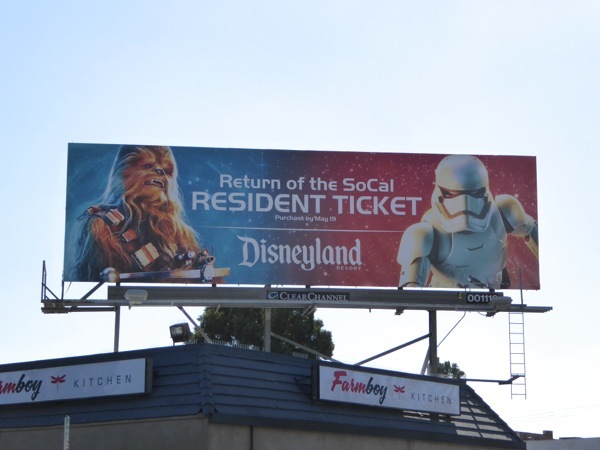 Well, actually you won't need your own Millennium Falcon to get there, as there's been an awakening in the Force at Disneyland in California. 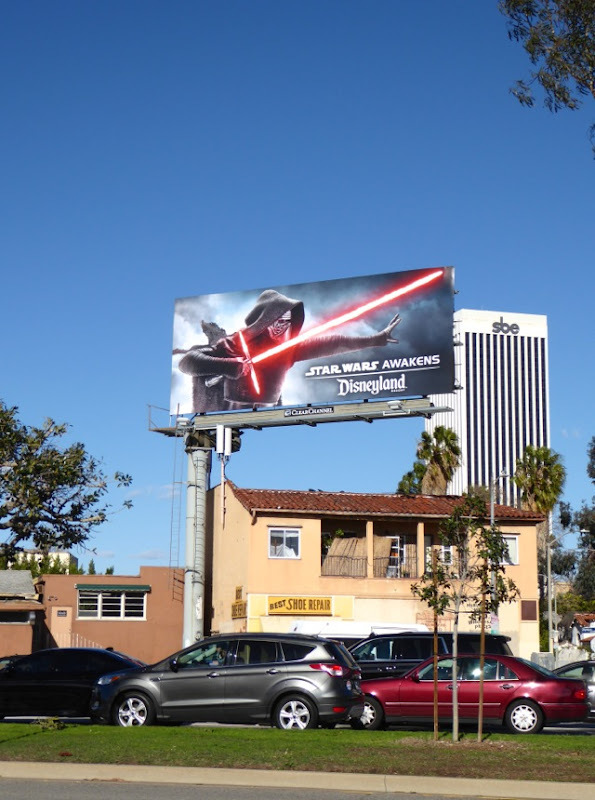 You knew it was going to happen, even before the new installment broke box office records, when Disney bought Lucasfilm for $4.05 billion in 2012, it was only a matter of time before we saw more of the Star Wars Universe integrated into the theme parks, be it attractions, characters or merchandise to buy. 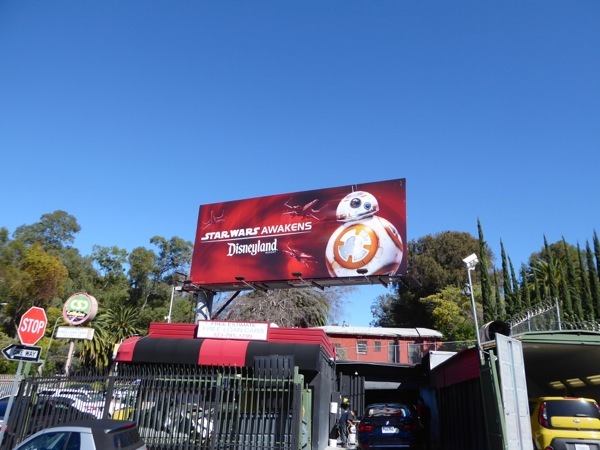 The menacing 'Kylo Ren' billboard version was first snapped high above San Vicente Boulevard on February 1, the adorable 'BB-8' billboard was spotted along Barham Boulevard on February 9 and the 'Chewbacca/First Order Stormtrooper' ad creative was spied along Vine Street on February 19, 2016. 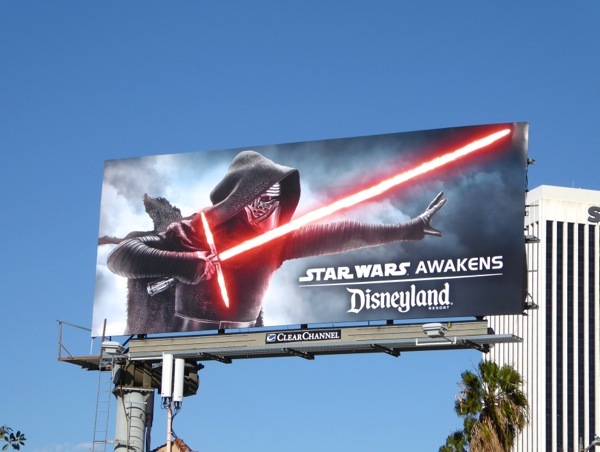 If you're a fan of the out-of-this-world movies, be sure to also check out these Star Wars: The Force Awakens billboards and all these supercool Star Wars movie costumes on display. 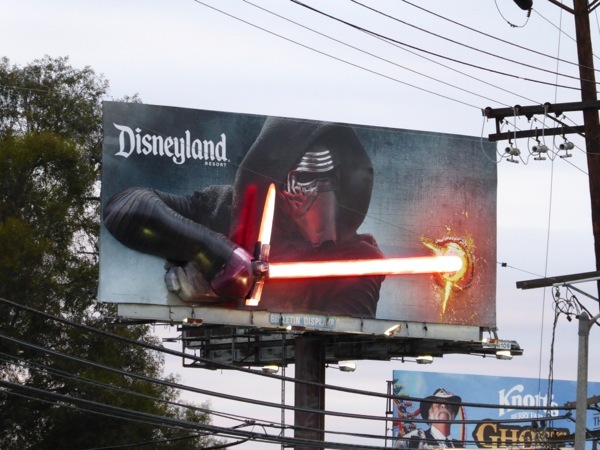 Meanwhile if you're a fan of the Disney parks, be sure to also enjoy all these different Disneyland billboards, including Halloween and festive ad creatives featuring favourite characters from the likes of Frozen, Cars, Toy Story and of course the cartoon character who started it all, 'Mickey Mouse'. 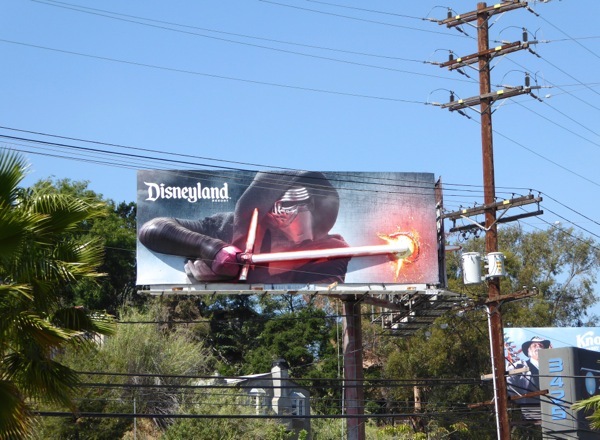 It goes without saying that the Force is strong in this park. 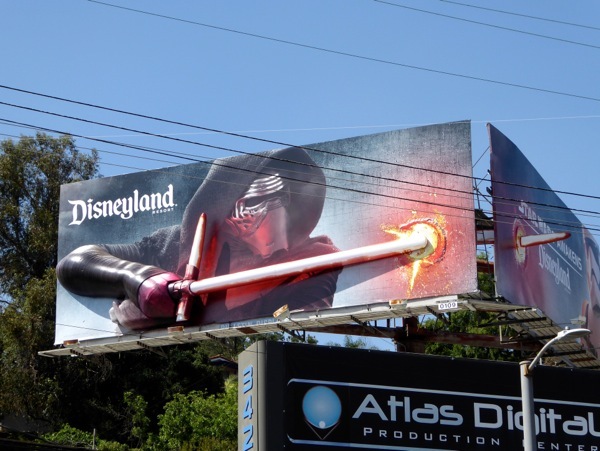 UPDATED: If you thought the standard BB-8 and Kylo Ren Disneyland billboards were cool and eye-catching, just wait until you see this special lightsaber installation in L.A.
Not only does Kylo Ren's lightsaber light up red at night, but his arm and hand are in 3D relief and his glowing Crossguard lightsaber tip pokes through the adjoining billboard featuring a First Order Stormtrooper. Working with Lithographix, those clever out-of-home specialists at Atomic Props & Effects built the arm and hand with foam and an internal steel frame, a polyurea hardcoat was applied to the foam and that was covered in a printed vinyl. 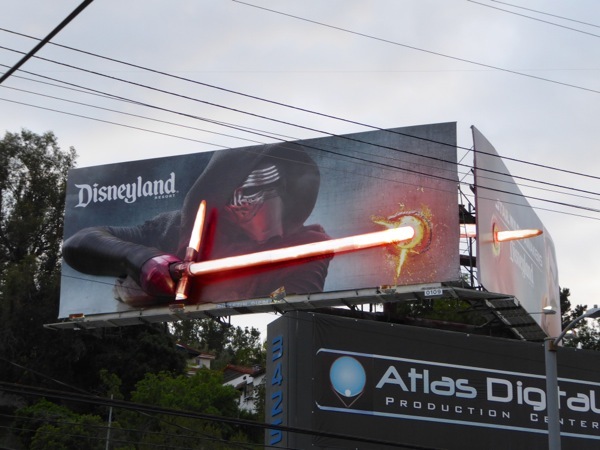 The lightsaber effect is created with LED light boxes. This spectacular billboard installation was photographed above Cahuenga Boulevard at Universal Studios Boulevard, the entrance to Universal Studios Hollywood, on April 10, 2016, a brilliant location to grab the attention of theme park visitors on their departure. 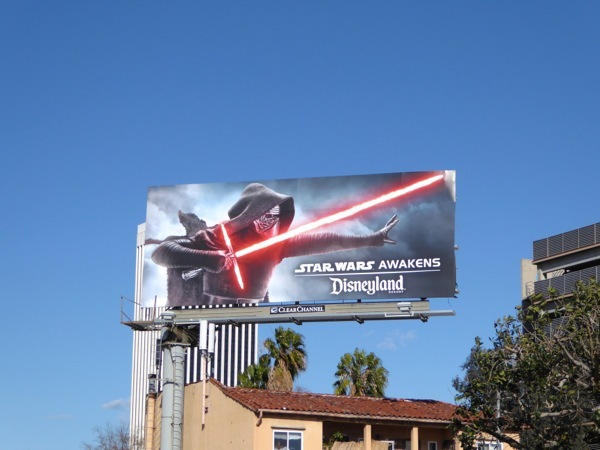 You can tell that Disneyland is wanting to leverage the power of Star Wars within its parks, especially as its competitor Universal Studios Hollywood has recently opened The Wizarding World of Harry Potter attraction this Spring to draw crowds. 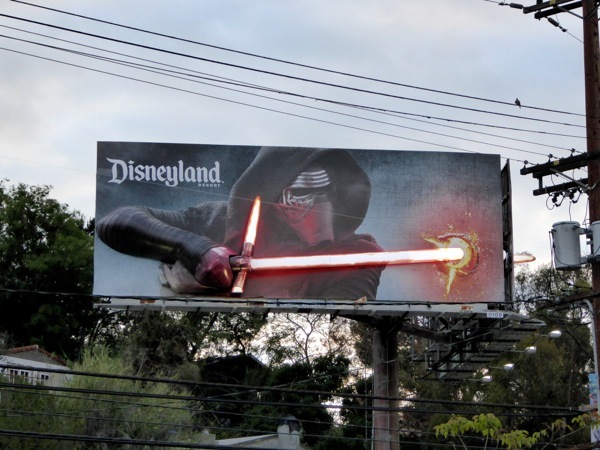 One thing's for sure, this bit of billboard theatre will turn heads, regardless of whether people are Star Wars fans or not. 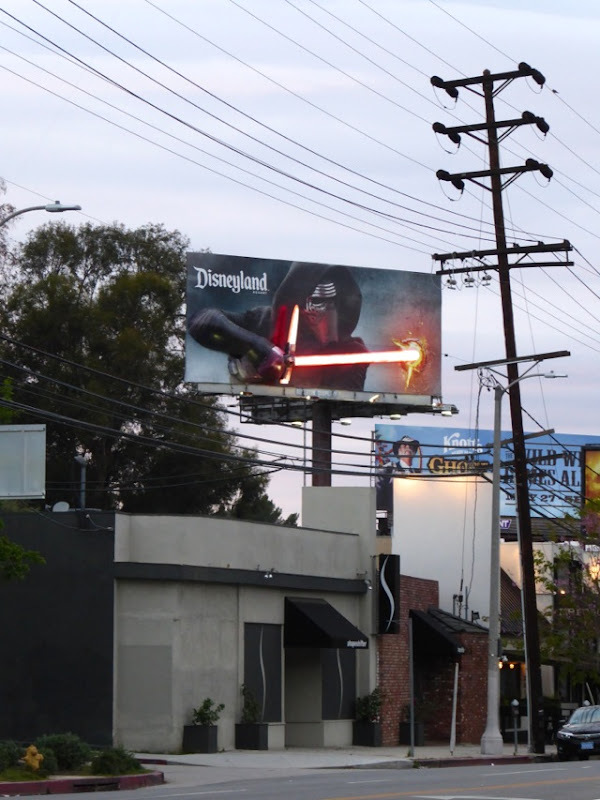 The Force is certainly strong in this example of outdoor advertising. 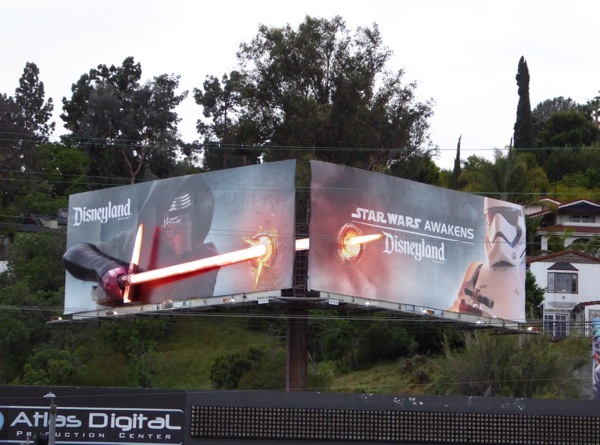 Plus here's also some daytime images so you can see how the 3D billboard looks without the lightsaber illumination at night, still pretty cool. 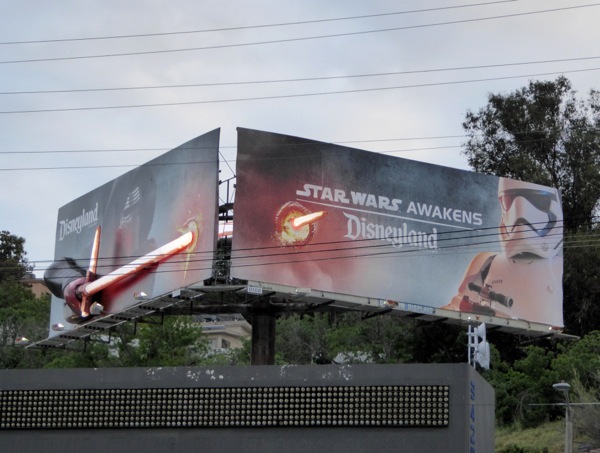 Daily Billboard loves this kind of drama in the skies of L.A. and this excellent example is certainly in the running for BAB Award this year. 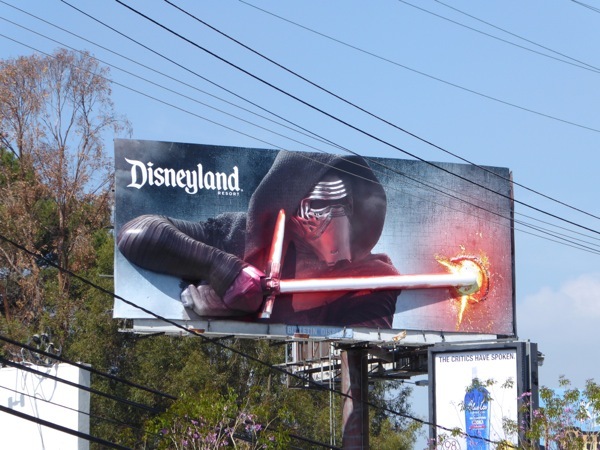 UPDATED: Here's also another Kylo Ren ad creative for Disneyland's 60th diamond anniversary celebrations. 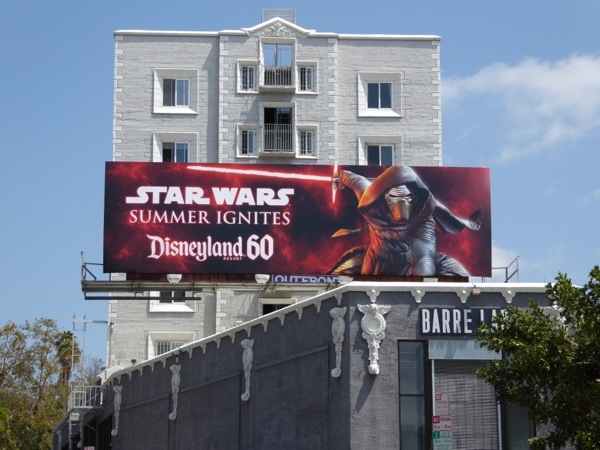 This Star Wars Summer Ignites billboard was photographed along Cahuenga Boulevard on May 26, 2016.